Haryana Chief Minister Manohar Lal Khattar on Monday announced development works for Jind Assembly constituency represented by late Hari Chand Midha who passed away recently. Even as the Opposition members alleged this announcement was a ploy to gain public support in the bypoll to be held in the constituency following Midha’s death as there was no such precedent, the CM defended the move saying the Assembly can always set up a new tradition. Speaking on the second day of ongoing session of Assembly on Monday, Khattar said Midha is no more but fulfilling the demands of his area would be the real tributes to him. Nine questions of Midha including eight starred and one un-starred were lined up for the session, he said. The CM announced three new roads for his constituency and said that the work for the setting up of 132 KV Sub Station in Sector -9 Jind would be completed by December 2018. He said though there is no proposal to upgrade the Government Girls High School at Barsola village yet, but the state government has decided to upgrade it to Government Girls Senior Secondary School as a tribute to Midha. 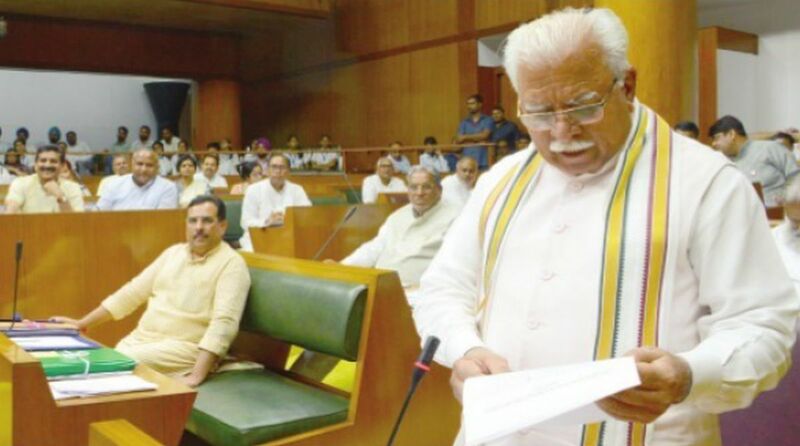 Replying to a question which was to be raised by Midha, Khattar said that from the year 2014 to till date, 12 Government High School have been upgraded to Senior Secondary School and eight Primary School to Middle School in the Jind Assembly Constituency. A two-time Indian National Lok Dal (INLD) legislator, Midha (76) was suffering from a kidney ailment and passed away on 25 August. Midha retired from the Army and then started social service. Recognised for his social work in Jind constituency, he contested on INLD’s ticket in 2009 and 2014 and won both times.